After more than a year of waiting, from the international EBC it has released version 5.0 Matrix of the common good. 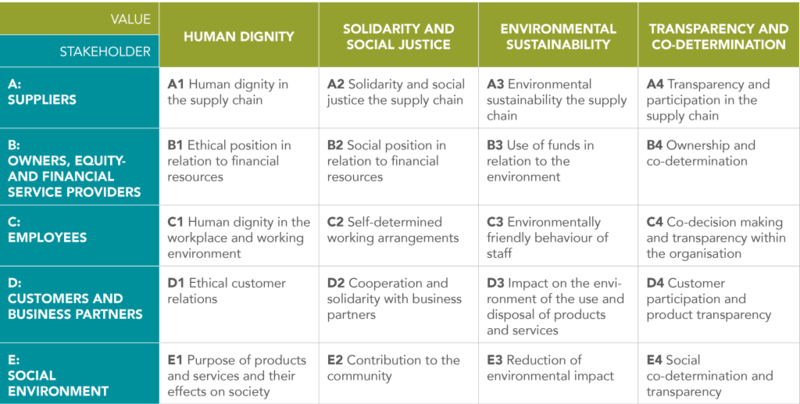 As notable aspects appears on one side merging the two criteria : social justice and solidarity into one. Recall that in the previous version (Matrix 4.1) these two criteria are treated separately, for social justice he represented the distribution of wealth (a more economical positioning) and solidarity focused more on aspects of knowledge sharing, progress, people, collaboration with other entities, …. to merge, You will have to take into account sub-level as clearly specify these two visions. On the other hand, Another interesting aspect is the division of the stakeholders of providers and payers in 4 criteria, which so far they were fused into one. In fact from the moment we all knew it was incongruous to have fused these 4 one criteria when evaluating these stakeholders, and it was a matter of time separated. For funders personally think they could have kept fused, but in the case of suppliers it was a key aspect drill down. The manual is in German and are looking for translators, so for now we will have to work with the manual 4.1 unless you know the language. We hope that by September we have the materials in English and Spanish.